You have questions, and we have answers. Please check out the page below for answers to some of the most commonly asked questions. WHAT IS THE AMERICAN-MADE HEROES PROGRAM? Evan Williams American-Made Heroes is a program that celebrates military heroes by sharing their proudest stories of service to their country and community. WHY ARE YOU SHARING VETERAN STORIES? As an American-Made, American-owned company, Evan Williams wants to honor those brave Americans that have made our country what it is today by sharing their heroic stories with the rest of the world. WHAT IS THE EVAN WILLIAMS AMERICAN HERO EDITION BOTTLE? Evan Williams has created 6 custom bottles, each telling the story of one of the Evan Williams American-Made Heroes. The bottles will be available nationwide for a limited time. HOW DID YOU SELECT THE 6 AMERICAN-MADE HEROES? After reviewing thousands of brave stories from military veterans across the country, we selected the ten most inspirational military veterans who are continuing their call to service in their communities today. IS THIS BOURBON DIFFERENT THAN THE EVAN WILLIAMS BOURBON WITH THE BLACK LABEL? 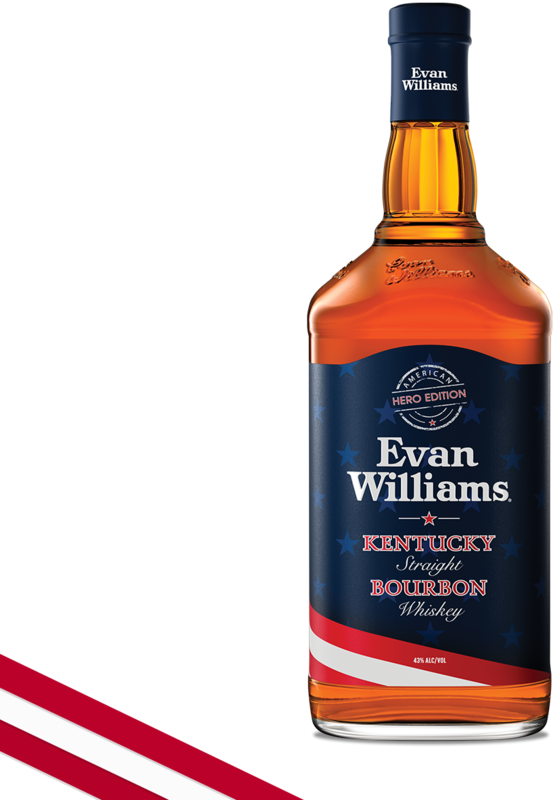 This bourbon is a limited American Hero Edition of Evan Williams Bourbon, each bottle commemorating the story of a heroic service member. The bottles will be on shelves nationwide in limited quantities beginning in May and available throughout June and July while product lasts. Please contact your local liquor store for availability. This bottle is similar in price to Evan Williams Black since it is a limited edition version of our Evan Williams Black bourbon. Pricing will vary depending on the state. Please contact your local liquor store for pricing. WHAT IS THE AMERICAN-MADE HEROES CONTEST? WHO CAN BE NOMINATED FOR THE CONTEST? I AM FROM OUTSIDE OF THE US, WHY CAN'T I ENTER THE NOMINATE YOUR HERO CONTEST? We're sorry, but this contest is only open to eligible residents of the US. Yes, you may nominate more than one person for the contest. However, you may not nominate the same person more than once. HOW WILL I KNOW IF MY MILITARY HERO HAS BEEN CHOSEN TO RECEIVE A "GIFT OF THANKS"? If your military hero has been chosen, you will receive a confirmation e-mail with all the details in August/September 2018. No purchase or payment is necessary to enter or win. See the terms and conditions for eligibility requirements. Just fill out the form and we will be in contact! HOW MANY CONTEST WINNERS WILL BE SELECTED? There will be up to 50 winners selected at the end of the contest period. Please see the Official Contest Rules for more information.